Five to ten minutes from the University of Texas and downtown, and listed on the National Register of Historic Places, Hyde Park is a rare urban village within a city. This Hyde Park cottage puts history, the spirit of adventure and the best of Austin at your fingertips. *Stand alone cottage means this property is not shared with any other people nor rentals, nor does this property share property line with an apartment complex, a rarity in Hyde Park. *Preserved architectural details include cabinetry, tiles, tub, sinks. *Signed art. Fine furnishings throughout from the 1930's and earlier. *Original hardwood floors. Wooden blinds. Solid wood furnishings from the home's era. *100% cotton linens. Feather pillows. Down comforters. Sealy Posturepedic mattresses. *Giant trees. Large backyard. Outdoor antique wrought iron furniture. *Garage offers covered parking and storage. Walk to the University of Texas, eateries, museums, live theater, Austin Farmers' Market, Avenue B's 100+ year old grocery store, Texas' oldest municipal golf course, public tennis courts and pools, top ranked public schools, Tour of Homes. The most valued real estate often includes top schools and this cottage is no different. This property has access to Lee Elementary School. Designated as a Blue Ribbon School of Excellence, this represents the USA's highest honor for a public school. Kealing Middle School is one of four Magnet schools in Austin. And McCallum High School has been designated as the Austin Independent School District's Fine Arts Academy. In 1994 I bought this home, my first historical home in Austin, and I have enjoyed being a landlord for over ten years. Separately, having used an imperfect diet instead of chemotherapy to reverse my own disabling disease, my other career uses over two decades as a Registered Dietitian to bring the healing power of food to others. As featured speaker for radio and TV, medical professionals, universities and corporations, I have authored a book that sells in twelve countries and is a best seller at Amazon. A documentary of my recovery, “The Incurables”, also airs internationally on Veria TV. My hope is to simply a healing diet for others on their path to remarkable results. I own several 1930's cottages in central Austin, all of them in neighborhoods on the National Register of Historic Places. For ten years I lived in and fell in love with this cottage for many reasons. In my humble opinion, this is the only neighborhood left in Austin that still retains the feel of old, laid back, quintessential college-town Austin, yet it offers immediate access to the best of what is new in Austin. A home built in 1850 is two blocks away. This street alone has six homes which have garnered commendation individually on the National Register of Historic Places. In addition to the extraordinary neighborhood, I was always grateful to enjoy so many original details of this home. Having spent more than two years in Europe, architectural integrity, urban location and uncompromised materials along with a good price became what mattered much more than square footage. Thus beautiful cottages and cozy spaces are a natural fit for me now. I hope you'll enjoy this enchanting property as much as I do. Premium real estate and privacy at a reasonable price. Preserved historical details include original tiles in the kitchen and bathroom, original sinks and cast iron tub, original glass door knobs, original kitchen cabinetry, original ironing board stored inside the kitchen wall. Stand alone cottage with covered parking and a large back yard all to yourself because this is the only residence on the entire property. (Duplexes, triplexes and apartment complexes are extremely common in Hyde Park.) It's very easy to live car free in this cherished neighborhood on the National Register of Historic Places. Delightful parrot colony just one block north at the University of Texas Intramural Field. Comfort is ensured with all linens made of 100% cotton. Multiple very good grocers, restaurants, eateries along with a theater and a museum are all within walking distance. I insist on the highest quality materials throughout. Your bathroom experience will include Ralph Lauren towels, Restoration Hardware fixtures, restoration Hardware Cotton shower curtain. This property offers off street parking on the driveway next to the home for two cars, a one car covered garage, and street parking, too. Provides covered parking for one car. The garage also offers space for unsecured storage equivalent to the size of one car. The kitchen is fully stocked with cookware, China, silverware, cups, bowls, glasses, cooking utensils. Wrought iron table and chairs in backyard seat four. Shipe Park is within two blocks and has a swimming pool and a wading pool. Some of the pleasures of this house include the original cast iron tub, ceramic sinks, glass doorknobs, and tiles in both kitchen and bathroom. Time Warner's Basic Cable TV and WiFi are provided at no extra charge. There is no fence around the property. Under limited circumstances, with prior permission and an additional security deposit will some pets will be considered. Charming house in the PERFECT location! My family and I absolutely loved our stay in this charming and historic home. Located right in the heart of Hyde Park the house is within strolling distance to great neighborhood bars, restaurants and shops. The owner was very attentive, accessible and quickly responded to any questions we had (which were mostly regarding extending our stay!). I would definitely stay here again and have already recommended to friends. Thank you so much for being lovely guests. It was a joy to do business with you and your partners. Please come back soon! We had an amazing stay in this adorable Hyde Park bungalow. We had a longer stay, about 2 months, as we just moved back to Austin from New York and are working on renovating a house. The house itself is beautifully preserved, and we found it to be clean and comfortable upon arrival. This home is perfect for both short and long term stays- we loved the space and quickly felt right at home. During our stay Deirdre was sweet and helpful, always quick to answer a text. The Hyde Park neighborhood is a perfect way to get to know Austin- we loved getting coffee at Quacks, smoothies at Juiceland and going for swims at Shipe pool. We were sad to leave an would absolutely recommend this property to a friend! It makes my day to hear how much you got thorough enjoyment from my prized little cottage and Hyde Park. Thanks so much for being lovely guests and for posting a review. This lovely cottage is the perfect place to stay in Hyde Park. It is ideally situated on a quiet road and has a charming, secluded back yard, perfect for enjoying afternoon tea! The cottage is both charming and cosy, has everything you could possibly need and is well stocked with the essentials for a comfortable stay - Ralph Lauren towels, soft bedding, wi-fi, TV, coffee maker, powerful and hot shower, very efficient washer and dryer. The location of the property is within easy reach of all major Austin highways and is within close walking distance to a bunch of restaurants, coffee shops and stores such as Quacks Bakery and Mother's Restaurant. The owner is always very responsive and was a pleasure to do business with. We had a very happy 3 month stay this summer and would recommend this property. Thank you so much for your thoughtful review, Christine, and for being the lovely guests. Please come back soon. This is a beautiful house in an incredible location. The bed in the master bedroom is possibly the most comfortable ever and the house is the perfect size for a long or short stay. Overall, i could not recommend this house highly enough. It is always an honor if a repeat guest tries and enjoys another of my properties. Thanks so much for always eing a perfect guest and for giving my sweet little Hyde Park house a chance to prove her charms. And please come back again soon! 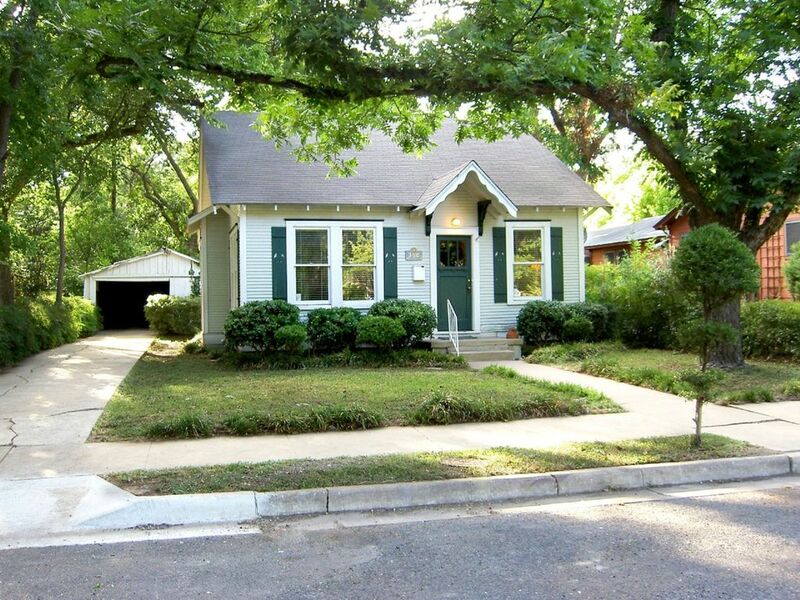 This is a lovely little cottage with a lot of character in one of the more unique Austin neighborhoods. The rooms are ample and bright, the kitchen is well equipped, and the beds are extremely comfortable. All that Austin has to offer is within easy reach, and I enjoyed being able to leave my car and use public transit to get about with ease - there are several bus stops a short walk away. Deirdre is a very helpful and attentive owner, and clearly is very fond of this cottage and wants her guests to enjoy it as much as she does. Thank you so much for being the perfect guest and for your thoughtful review. And please come back for a discount because you took such nice care of my property. Thank you! If you are wanting the quintessential Austin feel, this neighborhood & home are it. This IS vintage Austin at it's best. Pulling up to the curb with the gorgeous topiary trees either side of the walkway I knew I was in for a treat. The decor is very chic with a relaxing esthetic. From the crisp white cotton covered furnishings through to a beautiful antique bamboo bookshelf neatly stacked with magazines that I could have stayed an extra week to read. The beds were SO comfortable as were the pillows. I am a hard one to please on that front too. All the linens were crisp white, fresh & fluffy. The small adorable bathroom which is small but it is a 30's? cottage was fresh, bright & clean with original pale blue & white tessellated floors in a daisy pattern, so cute. It was lovely to sit under the huge pecan trees eating $100 worth one evening before going out to dinner at one of a huge variety of neighborhood eateries. Deidre, thank you for a wonderful stay & keeping this cottage in such gorgeous original condition, it was a delight to stay in it, you are a great Ambassadress for Austin, Texas. It means so much to me when someone appreciates this cottage as much as I do. Of my four properties, others are worth more on paper. This one, and this neighborhood, are by far my favorite. Thank you for your thoughtful review and please come back soon. Included on the National Register of Historic Places, Hyde Park is a rare urban village inside a city. Very few neighborhoods can boast of having their own sculpture museum, live theater, annual tour of homes, the oldest municipal golf course in Texas, 100 year old grocery stores, Austin Farmer's Market, the highest ranked public schools, public tennis courts and swimming pools, and restaurants galore. Proximity to UT makes it popular among faculty and graduate students, and those going downtown find the easy drive attractive. Hyde Park is also popular with young families who enjoy architectural integrity, quiet streets, parks and welcoming community. Walk to Antonelli’s Artisinal Cheeseshop, Quack’s Bakery & Coffee Bar, Asti Trattoria, Fresh Plus Grocers, Hyde Park Bar & Grill, Mother’s Vegetarian Cafe, Daily Juice Raw Cafe, The Avenue B 100 yr old Grocery, Vino Vino Wine Bar, Mandola's Italian Market, Dolce Vita Gelato and Espresso, Hyde Park Gym, Flying Saucer Pub. Other Activities: At UT: football and sports, LBJ presidential library, Blanton Art and Texas Memorial Museums. Golf: Within walking distance is the oldest municipal golf course in Texas, Hancock Public Golf Course. Nightly fees are $3195/30 nights for occupancy 1-2. Correct pricing includes no tax on stays of 30 nights or longer. Nightly fees are higher in March. Please email or call me for a March quote. If approved, pets apply towards total occupancy and incur additional fees, too. Thanks for looking.